Generally, Female Traditional Leaders(FTLs), also known as Queen Mothers (QMs) have historically occupied an important status and played active role in the Informal Governance (IFG) system in the Ghanaian society. But following the advent of colonialism and the creation of the modern state, the QMs were neglected in the Formal Governance (FG) system, leading to a consequent decline in their role. Meanwhile, recent dynamics have seen a revival of queenship in several areas across the country. But, despite the global and national efforts to empower women in governance; the QMs are still sidelined in the mainstream of FG. The objective of this research was therefore to trace the status and role of these QMs over time and to identify the main factors that led to the general decline in their role over the years. It brings out the dynamics, constraints and the factors contributing to the dis-empowerment of the QMs but also ask the question as to whether there are forces and initiatives to support QMs with a view to enable them play an important role in both the formal and informal realms of governance in present day Ghana. 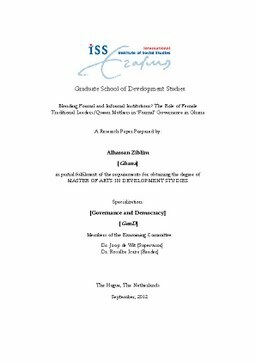 This paper frames their role in terms of gender, institutions and women's empowerment. The findings indicate that while the role of the QMs' has declined over time, they still play some relatively active role in Ghana. It also suggest that the deliberate neglect and exclusion of these QMs within the initial institutional set up by the British colonial regime coupled with subsequent forces of male power and subordination, account for the decline in their role over the years. The findings again point to both internal and external forces as providing the impetus for the recent dynamics that has seen the rejuvenation of queenship in the Ghanaian society today, with progressive calls for their representation in the institutions of governance. However, the study finally produced fairly lack of detailed evidence to support the hypothesis that the QMs' inclusion in the institutions of FG could generally enhance women's substantive representation in FG in Ghana. Relevance to Development Studies There is the increasing realisation the world over, that women's representation in governance has become the sine qua non for building an equitable society, necessary for promoting sustainable and all-inclusive development. But generally, QMs in Ghana have historically played and presently continue to play a relatively active role in the IFG process in Ghana. This notwithstanding, they have been long neglected in the FG system. This paper therefore traces the declining status and role of these QMs over time with a view to enhancing their role in both the formal and informal systems of governance; and it is against this background, that I find the subject matter of this present study relevant to the field of development studies.